If members of parliament are O-Level-failed, it’s a failure of the legislature that reflects poorly on the struggling electorate as much as on state education. But when the chief executive demonstrates his grasp of the new math (“70=30”), it’s a triumph of the new society and the new historiography which eludes the rest of us plebes. 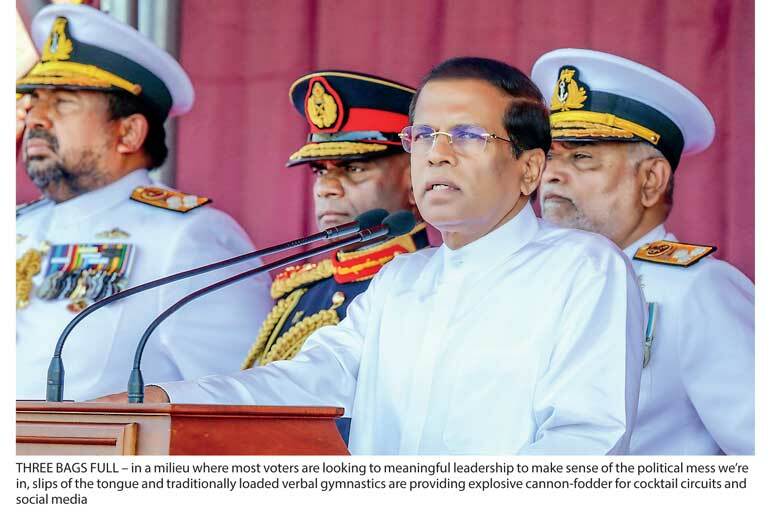 Sorry to note, though, that even patricians adept at culling four decades of national history – or perhaps it was merely the UNP’s 40 years in power that the President cut out from his national day speech – are prone to hidebound traditionalism in the self-serving interest of survival. One thing we can heartily agree with our head of state on is that corruption is a no-no for a nation-state at our juncture of development, or emergence from our dark ages… and it must go. Or, as our worthy more pithily phrased it, albeit thanks to an adroit translation or an erudite subeditor: “Anticorruption is the new patriotism.” This certainly makes for a nicer sound-bite than “Patriotism is the new nationalism” (2009-15) or “Neo-liberalism is the new developmental-ism” (2001-4, 2015-). Of course, to judge by recent developments, the President means to have his cake and eat it, and make ‘premier members’ of his cabinet eat humble pie to boot. If recent ‘arresting developments’ are anything to go by, the highest of the high in the land like no other sincerely believe that judgment must begin in the household of the gods. The house next door – i.e., the home of one’s coalition partners – is good enough for starters. There are those who might wonder if the indictment and arraignment of the principal accused in the bond scandal is an act, and if so whether the horse play can be maintained. For one thing among those interrogating the sudden activity of law enforcement with a hermeneutic of suspicion, the timing exudes an interesting aroma. Be that as it may, far be it from us to impugn the awful majesty of the law. Hail and hooray that at least a semblance of justice is being meted out, where previously a travesty – a two-act tragicomedy – prevailed. Might we hope that the imperatives being acted upon by HM the Mikado MS will prompt HE the Lord High Poo-bah RW that Something Must Be Done to cleanse the Augean Stables of sullied party coffers, crooked campaign financing praxis, and the Nelsonian-eye ethic which benefits one personally as much as in a partisan sense. I’m not holding my breath beyond the tenth of February. Because when the dust has settled on the biggest poll in some senses in our recent history, I’d like to see who’s still standing and who’s outstanding – if you know what I mean. Since a promise to arrest the alleged criminals still swanning about as large as life to this date is as good as any other undertaking by the name of manifesto, let’s not bring up the bodies quite yet once again. However patriotic (in the older sense of the word) our absconder may be, naïve and sentimental are not the honourable epithets we would attribute to the senior bureaucratic strongmen who won the war. If the bird doesn’t fly the coop at his impending arrest, at which the wolves are slavering, we’re all living in a gilded cage. Some of us are still living in a fool’s paradise when a relatively junior police officer is arrested in a volatile case that has been under national scrutiny for so long… at the eleventh hour before a key poll! The noises made about consulting the upper echelons of the legal domain for advice on the arrests of other senior defence officials supposedly culpable in the killing of the errant editor may well be part of the managed spectacle. Forgive me for the sceptical spectacles. I’ll rejoice with the rest of you cynics when justice has finally been served – in the full knowledge that even dead men (of whom nothing but good must be spoken) were well and truly capable of playing political games for the highest stakes using their journalistic legerdemain for less than noble causes. Speaking of which, many must be the venerable greybeards who nod sagely at a prime ministerial sentiment that his assistant leader of the party ‘must’ – or was that ‘may’ or ‘might’ – step down... or do well to – or whatever other gracious opinion was expressed with the utter disdain for treating a nation of voters as adults that the GOP has mastered for decades. Let me not even get started on the despicable ex-despot who would be tyrant and saviour for life, who (with no sense of guilt or shame) pokes the number-crunching sleeping bear from the sidelines with his sidewinder missiles – rattling sabre about how the sovereignty of the state is compromised by coalition politics. By the way, happy independence is compromised in no little measure by what happened down Hambantota way over the past several decades under the rule of men entirely lacking in a sense of macroeconomic proportion blinded by their bloody ambitions. But we were discussing having your cake and eating it. The President in his address to the people of the nation deserves applause for pinpointing corruption as the single greatest impediment to the implementation of the national interest (in a matrix of the Growth, Development, Progress, we aspire to and certainly possess the potential for). However his call for safeguarding the traditional values and culture of our ancient civilization must give us who live in the twenty-first century pause. This is not merely a case of the shudders at what hidebound disaster may befall civil society and the liberty we thought we’d won with the defeat of ultra-nationalist secessionism or the hideousness of lap and pole dances to mark our freedom. The latter’s a matter of taste, and the former a case for the law courts anyway. “Time will tell if there is sufficient political will to see the anticorruption drive which has recently got off to a new movement in fits and start move the machinery of state into higher gear.” Critically engage. Willingly suspend disbelief. Come on, you can do it! I. Translate this: “For one thing among those interrogating the sudden activity of law enforcement with a hermeneutic of suspicion, the timing exudes an interesting aroma.” Is it synonymous with ‘it stinks’? And why are you so suspicious? II. Interpret this: “Might we hope that the imperatives being acted upon by HM the Mikado MS will prompt HE the Lord High Poo-bah RW that something must be done to cleanse the Augean Stables of sullied party coffers, crooked campaign financing praxis, and the Nelsonian-eye ethic which benefits one personally as much as in a partisan sense.” Apply it – we mean you, Your Majesty and Your Excellency! 2.Which of the following does not represent a traditional value? 3.Would you consider any of these a truly ‘arresting development’? II. We’ll be dependent on (China/India) _____ for the next _____ (30+70, 70-30, 30-70, 30x70) years. III. GDP is key to _____ (Growth/Development/Progress/a second term). IV. Defending traditional values keeps _____ (patriots/nationalists/presidents/all of the mentioned) happy. A senior journalist, the writer is Editor-at-large of LMD. Not a traditionalist at all he still believes that what is worth defending nationally is worth dying for; but not in vain; and not if it is covered up.